The day Martha Winter decided to tear apart her family began like any other day. 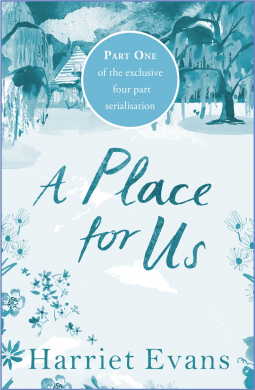 So opens A Place for Us by Sunday Times bestselling author Harriet Evans, a book you'll dive into, featuring a family you'll fall in love with ... and never want to leave. If you devour Rosamund Pilcher and Maeve Binchy and have discovered Jojo Moyes, you'll be thrilled to add Harriet Evans to your collection of favourite authors. The house has soft, purple wisteria twining around the door. You step inside. The hall is cool after the hot summer's day. The welcome is kind, and always warm. Yet something makes you suspect life here can't be as perfect as it seems. After all, the brightest smile can hide the darkest secret. But wouldn't you pay any price to have a glorious place like this? Welcome to Winterfold. Martha Winter's family is finally coming home. Review: As some of you may remember I only purchased a Kobo e-reader and tablet last July. I registered on Netgalley and at first I could not work out how to get my beautiful electronic proofs onto my device. It is safe to say one of the books I was sent was archived by the time I worked it out sad but true. Well since then I now seem to know what I am doing yay. I received an email telling me I could automatically be accepted for Harriet Evans A Place For Us part one. Having devoured Harriet's Happily Ever After I have been itching to get the chance to read more from her and this was that perfect moment. If I am brutally honest there is not a lot to tell based on part one. We are introduced to each of the characters with each of them having their own say. I truly love the way Harriet has built up the story as a reader you are constantly wondering about each character, and where their tale will take them. I must admit I do really like Lucy the wannabe journalist, she just hasn't been given the lucky break she deserves or could her best scoop be closer to home than she realises. Is Lucy willing to risk it all for her career, what does this mean for her family. It's safe to say even the most dysfunctional characters you'll warm to. Each character has their own distinctive voice and story and every family has their secrets.